HighPerformanceResumes.com ~ Call 401.261.2401 - HighPerformanceRésumés.com Call 972.968.8640 Today! Darrell DiZoglio, CPRW is in Dallas Texas. 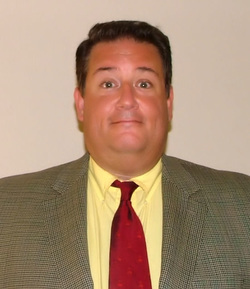 ﻿﻿﻿The reason why I am so successful helping my clients get hired quick is my decade of experience as a Hiring Manager and Recruiter, 25 years experience as a freelance copywriter and my 30 years experience in Sales, Marketing, Advertising and Finance fields. I have a collection of trade secrets that open doors to dream jobs and solve problems for my clients. Bookmark this website in your Internet browser now, you will be glad you did. What solid evidence of your Résumé Writing expertise is there? This whole page is loaded with evidence including my own résumé, which I know you want to see. Don't miss dozens and dozens of 100% transparent Linkedin recommendations from clients hired quick on the bottom of my Linkedin.com profile. Now that is serious independent third-party evidence. But, wait there is much more (click the red and white PDF logo to the left of the files below for convincing and compelling independent third-party evidence of my expertise). professional peers (Linkedin has over 375 million members in 2014). None of my 10,000 peers on Linkedin ever came close to beating me in the expert rankings. Linkedin decided to discontinue the experts rankings altogether to cut costs in February 2013. Linkedin.com is the tenth most popular website in the United States according to Alexa.com and easily the #1 talent acquisition resource/resume database career website among US employers, recruiters and HR professionals. I was the #1 Ranked Expert in Careers and Education Nationwide on Linkedin (2011-2/2013) and the #2 Expert in Job Search Nationwide on Linkedin (since 2011-2/2013) both versus thousands of professional peers. My Certification as Professional Résumé Writer with PARW (a photo of my certificate is on the very bottom of this page). My Certification is also verifiable at the PARW main website under CPRWs located in Dallas, TX. This is the original, most popular and best association for CPRW's. High standards matter. Many writers are turned down for certification, so insist on a CPRW. My professional résumé writing samples are available here for your inspection (rare). See them all on the Samples page. Just like a novelist, home builder, artist, actor or architect, viewing an expert's work is clear evidence of expertise. While others are focused on mass production, I have one standard for my clients - excellence and it shows. This successful website is another fine sample of my persuasive sales writing and value building. Normally this is missing in résumés. Every client of mine receives a thorough personal interview like a veteran hiring manager would give you (rare in my profession). Examine my 28 years of professional experience, achievements, college education and core strengths all distilled down to a one page High-Performance Résumé. View it right on the Samples page or on my Linkedin profile. Few of my of my colleagues ever show their own résumés. I wonder why? I have a decade of experience as a Hiring Manager and Recruiter (100% essential, yet so rare for CPRWs). This is essential because as a hiring manager you have to live with your own hiring mistakes, so there is an accelerated learning curve you must surmount. I post all my affordable prices right on my services page ahead of time (I respect your time). Compared to other CPRWs (equal expertise is rare) or corporate résumé services with that outsource for pennies on the dollar, you will save lots of cash and enjoy a substantial upgrade in content, effectiveness and ROI. Consider the fact that as successful independent CPRW/High-Performance Résumé Writer I have needed no paid advertising since 2008. I started writing professionally back in 1991 and began writing résumés in May 2004. My clients are loyal and generous with their referrals. I have already flourished as a self-employed writer for 25 years mostly in Providence, Rhode Island and Dallas, Texas. Surviving that long as a self-employed writer is more proof that I deliver real results. Examine all my résumé samples because seeing is believing. I wrote, edited and published a popular eBook in 2011 then updated it yearly and my wonderful clients receive my game-changing job search eBook free with a significant purchase. I have also written hundreds of info articles online to help job searchers on HowToFindWorkNow.org. A similar effort earned me Platinum-Level Expert Author Status with EzineArticles.com. Very few expert authors achieve this status at EzineArticles.com. With a résumé in the top 1%-5% you will earn plenty of interviews and you can take advantage of multiple job offers. During the last three years most of my résumé clients were hired within 90 days. When you compare this to previous results without my help, the performance difference will be obvious. If that is hard for you to believe, it is only because you have never had a top 5% résumé from a genuine High-Performance Résumé Writer. Return on investment - You can easily reduce your job search to 1/3rd the normal length, that alone will save you eight months of lost salary and benefits (average savings of $32,000-$48,000 depending on your earnings). Note the TOP RECOMMENDED PEOPLE badge on my LI profile (under groups near the bottom) earned for qualifying with all my Linkedin recommendations/reviews from clients (rare). Only 1% of professionals nationwide have the high number of recommendations I do. I earned official recognition from Linkedin in January 2013 for a Top 1% Most Viewed Linkedin Profile during 2012 without any paid advertising. This speaks volumes about my writing, marketing and SEO efforts. Earned Google Knol's Top Viewed Author Award and three Top Ranked Google Knol Awards for five star info articles that helped job hunters. How do I start the process? Easy, just pick up the phone and call me for an appointment. My Office hours are 9 - 9 M-F CST and Saturday by appointment only. First, always email me your current résumé with your #1 most desired job title goal and mobile phone number. Do you give free objective résumé reviews via email? Yes all the time for those who want professional assistance. I will get these back as soon as I can 24-48 is my normal turnaround for reviews (ddizoglio@gmail.com). Please make sure you send me your most current and best résumé/CV. Would you mind if I called you? I would be happy to hear from you. First, email me your résumé of course. I need something to refer to since I might not know you yet. If there is no answer, I am on the line with another client. Simply leave a message and I will get right back to you. What payment methods do you take? All credit/debit cards and personal checks. 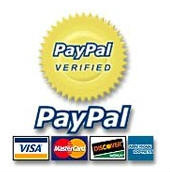 Yes, you can make small monthly payments on your credit card by paying through PayPal. Are you a Certified Professional Résumé Writer? 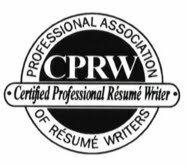 Yes, I am a Certified Professional Résumé Writer with the Professional Association of Résumé Writers. They are the oldest and original professional association for promoting high résumé writing standards. 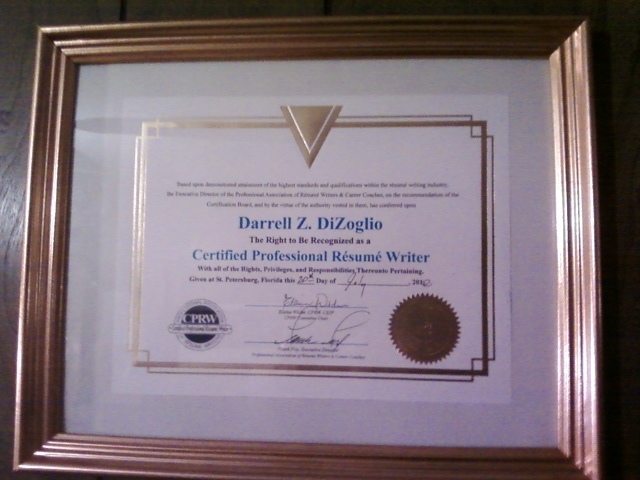 I am a member of the Professional Résumé Writing Association. I agree with their standards of ethics and professional conduct. It will be clear by inspecting my website and work that my standards are far higher than most of my colleagues with or without certifications. My transparent client reviews on Linkedin.com and work samples verify this as well. What are your typical results? Most of my clients are hired within 90 days or less, which is less than one third the normal time to find suitable work. Some clients like executives are far more discriminating, so I advertise 1/3 the normal time to be conservative. Frankly, the results are not entirely in my control. I provide a detailed set of instructions on how to get hired quick with your new documents. What if we want some changes made in the finished product? I suggest that you call or email me with those changes within three days of delivery so your interview is still fresh in my mind. I will gladly make changes for you. Obviously, you do receive editable documents for your convenience. You should email me your finalized résumé for safekeeping though, I will keep a secure back up copy in case your hard drive crashes or you lose your originals somehow. _﻿What are your Satisfaction Guarantee det﻿ails? It is a 100% satisfaction guarantee. I write your résumé for employers, yet we certainly will make revisions if you need them. Please review your finished documents immediately upon delivery and communicate all minor revisions all at once via email. Like any all service business that employs experts to do customized work, there are no refunds. You may review my work before ordering to confirm my professional ability. I use a proofreader to double check all my documents but know this, perfection is reserved for God alone. Please understand thanks to your thorough personal interview, my experience and expertise I present a finished product to clients. The whole first draft, second draft and third draft routine is for amateurs and part-timers that do not care enough to personally interview their clients. How does this work? My process involves: 1. A personal interview, with a lot of questions, listening and note taking from me. 2. Strategy creation, research and document writing. 3. Professional editing and proofreading. 4. Delivery, review and feedback by client. 5. Revisions if needed and complete satisfaction from a team of three professionals working on each résumé. Managers, Executives and other high earners that pay for premium services also receive extra time interviewing, job search advice and strategies during the interview. The bottom line is, my process is goof proof at making sure my clients are satisfied. All documents can be edited by you anytime. Executive, MBA and Fortune 500 caliber service is no accident. Why are your prices so expensive? Type written work histories, resume builders and other generic resumes written by fast and cheap typists are obsolete and useless. Your career is far more important than that. Results matter, so I carefully research and include relevant keywords. My writing is convincing and compelling. My services cost considerably less than one week's pay. Yet, the result is often years of safe and secure employment for you. This is definitely challenging, time intensive work that involves deep thinking, serious expertise and focus. The reality is my prices are far less than the big corporate résumé websites that have a huge middleman mark up and advertising expenses. More importantly, my work and your ROI is superior. I suggest you deal directly with me your independent Certified High Performance Résumé Writer and save 6-12 month of wasted effort searching with a weak, generic or useless career documents. Employers want to hire candidates who rank in the top 5% today. How will you deliver my new documents? Usually via email, if you pay postage I can also send U.S. Mail. I can save to a CD and send also for a minor fee for time and postage involved (a bit tedious). Formats: MS Word 2007, 2003, 1999; MS Works 6.0 to 9.0; and PDF (universal). A Minor fee is assessed for ASCII files. How long have you been writing Résumés? Since May 2004, so I have had plenty of time to develop some very effective trade secrets only my clients know about. Fortunately for me, my entire 27 year career has been in Sales, Marketing, Finance and Management. I also have over 23 years experience as a Freelance Copywriter too (very similar to great resume writing except that Copywriters market/sell products, brands and services). Certainly being a Hiring Manager, Recruiter and Copywriter has been a great help in getting my clients hired promptly. Frankly, I cannot imagine any better preparation. When do I get delivery? Shortly after payment is received. Three to four days is my normal turnaround time. Four to five days on executive, longer or more challenging specialized niche/technical assignments. Do you specialize in my profession? Better! I specialize in knowing what the hiring managers want in an ideal candidate and catering to that need by emphasizing all your relevant strengths, skills, knowledge and abilities and accomplishments. That is because I was a Hiring Manager myself for a decade. My résumé is posted here. I write High-Performance Resumes for new college graduates, white and blue collar professionals, managers, candidates transitioning from military to civilian, candidates transitioning from one career to another, management resumes, and executive resumes. Are your great testimonials real? Yes. See my Linkedin profile endorsements, they are all 100% transparent and real. Linkedin recommendations cannot be altered or edited either and more importantly you will always know the source. These were earned the good old fashioned way. Thank you for caring enough to give public feedback. Listening well to my clients over the years is how I became this good. Still, there is not a perfect human being on this earth. Even I do need to have a proofreader. If I am stuck in my job search will you help? Of course! I only charge $49.95/hour for job search coaching and career coaching. That is also why I wrote all those info articles for job hunters on HowToFindWorkNow.org and EzineArticles.com. All of those articles were the result of clients who asked for help on a topic. Will you meet with me in person? Yes, if you are local to Farmers Branch/North Dallas, Texas or the DFW area or you can drive here for an appointment. Otherwise, I have thousands of clients all across the U.S. and Canada and will interview you by phone. I can also call you back so you will not pay for long distance phone calls if you are in the U.S.A. Whether you choose phone or we meet for the interview there is no difference in the final outcome. Note: Please do not ever come unannounced to my home office because we have a Siberian Husky that looks like a Large Wolf. Our dog is a very protective watchdog, so always call for an appointment first. Where is your questionnaire that we fill out and send back? I normally interview my clients personally for superior results, better service and more customized documents. It seems it is the follow up questions and answers that make all the difference in the world. This service is about getting you hired, not typing, so follow my lead. Will you be able to handle my profession? Yes, although occasionally I have to pass on a few professions that are unknown to me, just ask me first. I have tons of intense experience here since 2004, we also must try to please HR Managers, Recruiters and contacts who can give you referrals to employers. Thus, we try not to load up resumes with industry specific jargon, other than the all important keywords that is. As in any sales and marketing document our main goal is sell you into a new job. To do that we want an easily readable and understandable document. My dedication to your success is clearly demonstrated in the interview process and in the last three years most of my clients were hired within 90 days. Can you write Military to Civilian Transition and Career Change Résumés? Yes, I have a great success rate on both of these. I have lived in RI and Texas both states have plenty of military personnel on all the nearby bases. I also am referred a lot of new military clients. Do you have any guarantees? As long as you are willing to work, I am willing to help you. Naturally, I write résumés to please the Hiring Managers. But, if you want some changes I will gladly make them. I have a clearly posted 100% satisfaction guarantee. My interest in your satisfaction is exactly why I interview all of my clients myself before I write a single word. In this case you are actually writing your résumé and I am your writing instrument. How do I know you are really talented? Read my website, inspect my own résumés, writing samples and my transparent reviews from clients on the bottom of my Linkedin.com profile. Remember, I was ranked the #1 Résumé Writing Expert in the Nation for five consecutive years on Linkedin vs. thousands of professional peers. Most importantly, you will be talking to me directly about your writing project. If I can please Fortune 500 Executives, HR Directors/ Managers, Professional Writers, Lawyers, Electrical Engineers and IT Directors you will be happy too. Why should I order from a small business professional? You will experience a much higher level of service and exceptional result in your job search here. I do not have an assembly line. I have plenty of time for brainstorming, interviewing and researching the finer points. Obviously, I specialize in just one area, getting people hired. Take advantage of my expertise and profit from it. The cost of my services are still less than a weeks pay. Great résumés and cover letters pay long-term dividends. Also, big corporations are well known for excessive overhead and costly advertising while simultaneously farming out the actual labor to the lowest cost provider available overseas. Will my financial transaction be safe? I use the safest possible PayPal.com payment services, so all your private banking and credit card info stays confidential and I never even see it. This is the wave of the Future. Currently PayPal.com handles over $87 billion in sales each day. That said, I still get personal checks via the U.S. mail too and gladly accept them. Naturally, PayPal also has an additional layer of buyer protections which means, if you don't get your documents delivered you get your money back promptly. 100% safe transactions here so no worries. I never ask for your credit card numbers or other confidential info. Do I need a PayPal Account to pay you? No, you can instantly sign in at PayPal.com through an invoice I send to you and make a one time payment there. If you do not have a PayPal Account already, just remind me to invoice you if I forget too. I also accept personal checks and cashiers' checks. I work days can I call you in the evening? Yes. I typically work 9 a.m. to 9 p.m. Central time Monday through Friday, and Saturdays by appointment only. Am I willing to edit and proofread your résumé before you distribute it? Yes, refer to the services page for all prices and available services. My rate is an affordable $49.95/hour. Is your résumé available for viewing? Yes, see indeed. I want you to see it, so you will have confidence you are making a great decision when you select me. This is an ultra condensed style with accomplishments. It is difficult to produce due to the extreme space limitations, yet it works well. I have often wondered why other résumé writers never show their own résumés to clients. However, after hiring many of them and seeing their sub par work, I understand. How many people get their résumés and cover letters professional written? About 90% of all professionals do if they earn at least $50,000 per year. It seems like all the most successful people do in any blue collar or white collar profession. These same people always are thinking proactively and make sure to order their career documents well in advance. This way they are ready when opportunity knocks. Interestingly, opportunity seems to knock more often for those who are prepared in advance. It is very challenging work few excel in, so in this case delegation is a real wonderful thing and a great relief for many. What is the most important item in my job search? Your Résumé, Linkedin profile and cover letters are the linchpin of every successful job hunt. What difference does it make if you personally know the Senior Vice President of a Global Fortune 500 company if your résumé and cover letters are weak, off target or generic? Your résumé is summarizes all your credentials and will justify your hire. It makes all the difference in the world. Your résumé also sells for you 24/7 on the Internet, via email, in databases and in an employers hands. How important is my Linkedin.com profile to my job search? It is only as important as oxygen is to you. Linkedin is without a doubt the #1 résumé data base and talent acquisition resource for employers in the United States. The supplemental info there on Linkedin profiles helps employers make better hiring decisions and all the resources are either free or wonderfully affordable for employers, recruiters, executives, professionals and job hunters. Shouldn't you be were you will received the greatest amount of exposure? Should I have my Linkedin.com profile professionally written? Absolutely. Consider for a moment that it will definitely be at least 10 times more visible than your resume because Linkedin is the seventh most popular website in the US. In addition, Linkedin is the #1 talent resource/resume data base with employers, recruiters, HR professionals and hiring managers. Review my profile there to see what a fully optimized Linkedin profile can do for you. I am not sure why so many professionals have subpar to ordinary Linkedin profiles. That is not going to help anyone advance or attract great job offers.